Guess what?! 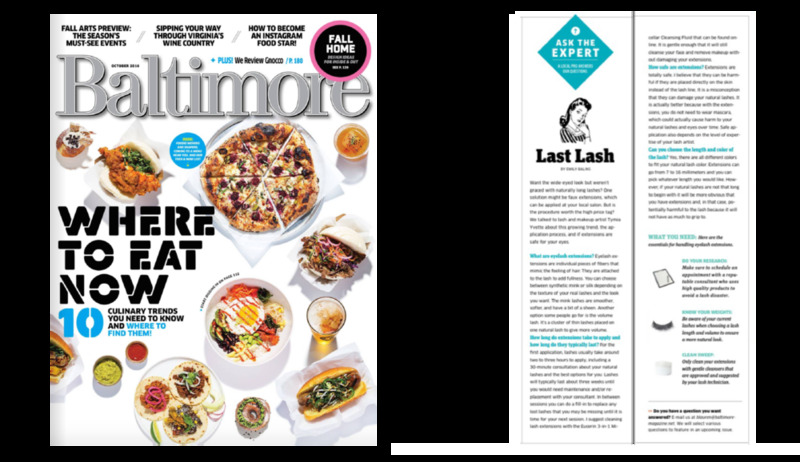 I was recently featured in Baltimore Magazine and was voted the GO-TO-GIRL for lash extensions (YES! I'm giving myself a pat on the back). Baltimore Magazine came to my studio to ask me some questions about lash extensions for their October 2016 issue. The published article was scaled down; therefore, quite a few important details were left out. But you're in luck! You can read the entire interview below. Extensions are small pieces of fiber or material cut and tapered to mimic the look and feel of real lashes. Today lashes are composed of high grade PBT materials. However, there are some extensionists still using acrylic extensions, which are harmful to the eyes. How long do extensions take to apply and how long do they typically last? Extensions take 2.5 hours for new clients. During the initial consultation, we first discuss the client's extensions -curl, length and thickness. I then walk he/she through the application process of the lashes. Once the lash application is complete, I recap with my client the extensions that were used (thickness, curl, etc). We thoroughly discuss all after-care tips, such as not picking, pulling or twisting the lashes, daily brushing and investing in a good cleanser. I always follow up with my clients 3 days after their appointment to make sure they are enjoying their lash extensions and if they have any further questions. To keep lashes looking full and flirty, lash fills are required. These fills allow the technician to replace any extensions that may have shed or cycled out. This process takes 60 to 90 minutes. I recommend making an appointment every 3-4 weeks depending on the natural lash growth cycle. There are many benefits to extensions. Unlike mascara, extensions do not require daily application or removal. Irritation does not occur. Many people don't realize the stress they put on their natural lashes by using lash curlers and removing mascara daily. Sleeping with mascara on is even worse. Another benefit is extensions that are are applied correctly can help the growth of natural lashes. Extensions that are too long and/ or too thick can cause stress on the natural lash. This is why it’s important for the lash artist to customize extensions. He/she needs to make sure the natural lashes can support the weight of the extensions. Your lashes should not feel uncomfortable or cause you any pain. Extensions should feel weightless. I know I briefly mentioned maintaining lashes in the previous question, but I cannot stress the importance of properly taking care of your lashes. It is essential to the lash retention. Every lash artist needs to make sure their clients do not run the risk of any chronic eye problems. 1. Cleanlash by Novalash 3-in-wipes - These wipes are great for my clients who are ALWAYS on the go. Great to keep in your purse or gym bag. They remove eye makeup, clean extensionsand condition all in one. 2. Lash Fresh Clean Wash - I recommend this wash to my clients who like a more traditional cleanser. This cleanser foams-up to clean not only the extensions but also the whole eye area. Its also great for oily eyelids. 3. Eucerin 3-in-1 Micellar Cleansing Fluid - This is not your traditional lash cleanser but my favorite. You can use it to cleanse the entire face including the lash line and eye area. Micelles water or micelles attract dirt and oil, so it will get rid of any impurities and bacteria that are on the lash extensions. This product is free of parabens, gylcol and PEG. However, not all Micellar Cleansers are free of Gylcol and PEG, Eucerin is one of the few. What advice do you give your clients? The most important advice I give is take time to find a RESPONSIBLE LASH ARTIST who will give you great extensions and great results.